Glass and Plastic Cleaner cleans windows, mirrors, glass display cases, CRT screens, TV screens, office equipment, Plexiglas, plastic, painted surfaces, counters, tabletops, vinyl upholstery, and any surface not damaged by water. It is excellent for removing dirt, fingerprints, grease, smoke film, and hair spray. 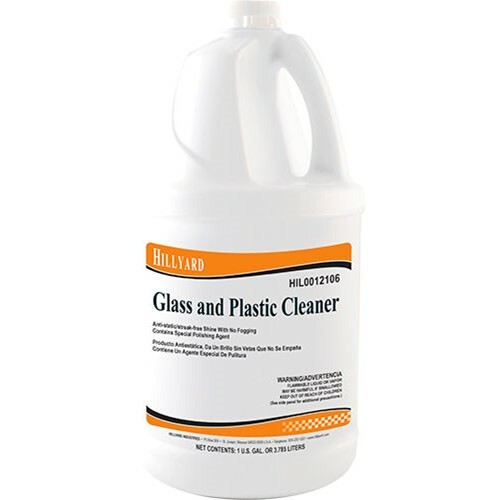 Glass and Plastic Cleaner has a non ammoniated formula that evaporates fast to help prevent streaking or filming. Antistat formula. Cleans without harming sensitive plastic surfaces. Evaporates fast to help prevent streaking. Helps eliminate fog on glass and mirrors.